Looking for a Portuguese Sheepdog? The Portuguese Sheepdog is a native herding dog breed of Portugal. Also known as the "monkey dog" because of its monkey-like appearance, this dog breed is rare and barely found outside of its country of origins, including the UK. Bred to guard and herd livestock, Portuguese Sheepdogs are relatively easy to train. They are excellent family companion dogs and get on well with children and other canine animals. 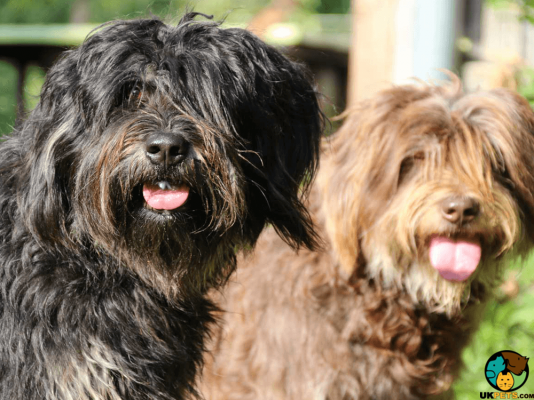 Do you plan on getting a Portuguese Sheepdog? Here is a brief background of this herding "monkey dog" native to the country of Portugal. The Portuguese Sheepdog, also known as Cão da Serra de Aires, originated in Serra de Aires, a mountain near the Alejentero region in Portugal, where it was bred to herd and guard livestock on farms. 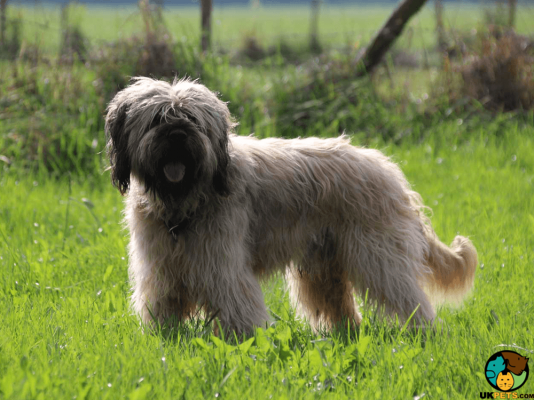 Although there are debates about the breed's ancestry, most records suggest that the breed existed only 100 years ago and is believed to be descended from the Briards that were imported into Portugal in 1900s. Others speculate that the breed is closely related to the old-fashioned European Sheepdogs such as the Pyrenean and the Catalan Sheepdog. Portuguese Sheepdogs became trusted companions of Portuguese shepherds because of their herding skills. However, they almost faced extinction in the1970s since they were mainly bred within the southern region of Portugal. 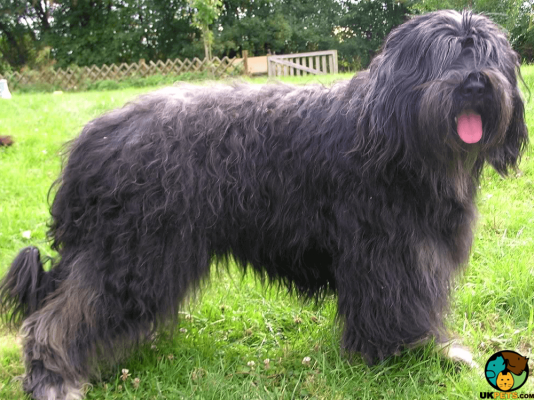 Thanks to a few breed enthusiasts, the Portuguese Sheepdog survived and was even nicknamed the "monkey dog" because of its odd muzzle and monkey-like inquisitive expression. Dr. Antonio Cabral and Dr. Felipe Morgado Romeiros wrote the official breed standard for the Portuguese Sheepdog. It was accepted by the Portuguese Kennel Club, and the breed was later recognised as a breed by the World Canine Organisation in 1996. People started exporting the Portuguese Sheepdogs to other countries, and slowly it became a popular companion and family pet in Europe. In 2006, the breed was recognised by the United Kennel Club and included it to the Herding Group, using the name Portuguese Sheepdog. Weighing 26 to 40 pounds and standing 42 to 55 centimetres at the withers, the Portuguese Sheepdog is a mid-sized herding dog. It has a well-proportioned head with a nicely defined stop and odd muzzle surrounded by furs that earned its nickname "monkey dog". It has round, dark eyes with a calm, alert and intelligent expression. It has moderately long ears that boast of having fine leathers set high and hang to the cheeks. Its nose is black, slightly raised with large, wide-open nostrils. The Portuguese Sheepdog boasts of a long single coat that is either straight or wavy and is quite harsh to the touch. The long hair forms a moustache, eyebrows and beards all over its face. It also has long hair throughout the body especially on the legs, including between the toes. The breed wears various coat colours that include yellow, grey, chestnut, fawn, and wolf grey. The coat needs to be brushed a few times a week to stay matt-free. Pay close attention to its moustache and beard since food can get stuck after it has eaten; wipe it with a clean and damp cloth. The breed sheds steadily all year round and especially during autumn and spring, so frequent grooming is needed. Aside from coat care, dog grooming also includes dental care, nail trimming and cleaning of the dog's ears. The Portuguese Sheepdog is loyal and hard working. It is active, easy-going and forms a tight bond with its family. Because of this, it is naturally suspicious of strangers and tends to suffer from separation anxiety. Although it has become a popular family pet and companion, Portuguese Sheepdogs retain their guarding instincts and as such are great guard dogs. Training-wise, this dog breed is smart and has a bit of a stubborn streak, which is challenging for novice dog owners. It needs to be reminded who the leader is in the household, so it does not become dominant. However, in the right hands, Portuguese Sheepdogs are naturally obedient once its role in the pack has been established. Portuguese Sheepdogs make incredible family pets since they are tolerant and patient around children. However, their herding instincts may compel them to round up the children, which may become a problem, especially with toddlers. With this said, supervision is a must to make sure that playtime stays calm and nobody gets knocked over. This dog breed gets on well with other dogs and cats they grow up with. However, the neighbours' cats and other small animals are a different matter, so care must be taken. Make sure to provide the Portuguese Sheepdog with dog food that is specifically formulated for medium-sized dogs as it has different nutrient needs than smaller or larger breeds. Dry kibbles or commercial dog food with animal protein (beef, lamb, chicken, and turkey) as its top ingredient will help promote muscle growth. Portuguese Sheepdogs are generally healthy dogs that can live up to 14 to 15 years. However, that is only the case if they are cared for properly and if they are lucky enough to avoid health disorders common to the breed. These health disorders may include Hip Dysplasia, Progressive Retinal Atrophy, Collie Eye Anomaly, and Abdominal Tumours. It can also have Ehrlichiosis, which is transmitted by ticks. Portuguese Sheepdogs are bred to work in the fields and as such are high energy dogs. They are also intelligent and will require plenty of physical and mental stimulations. At least 1 hour of daily exercise off the lead will suffice, as long as they are within a safe and secure environment. Securing a Portuguese Sheepdog in the UK will be difficult. It is a rare breed, which means only a few puppies are bred and registered with The Kennel Club each year so you have to agree to be on the waiting list. Purchasing a well-bred puppy will cost around £500, so if you don't have enough money yet then being on the waitlist works in your favour. Pet insurance is necessary but is optional. It is highly suggested to avail of affordable pet insurance, which costs around £50 to £90 a month, to help you offset emergency costs. The dog's daily food consumption will likely set you back around £30 to £40 a month, excluding the treats and snacks. Another significant expense is veterinary care, which includes vaccination, boosters, regular check-ups and neutering. Veterinary costs will cost around £1,000 a year. As a rough estimate, owning a Portuguese Sheepdog will set you back around £80 to £120 a month. However, it can be more depending on the insurance coverage and other expenses including professional dog training (e.g. canine sports) and dog supplies. 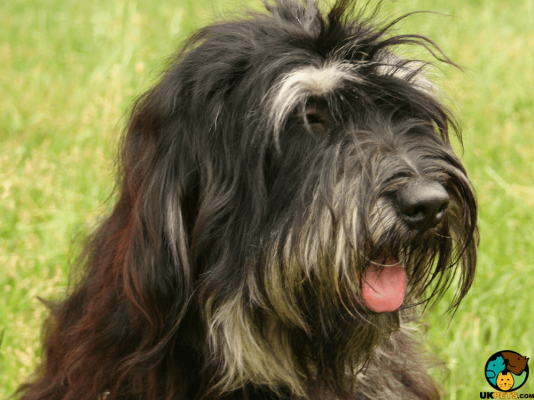 Is a Portuguese Sheepdog Right for You? The Portuguese Sheepdog is a native herding dog breed of Portugal. It retains its guarding instincts and as such is a great guard dog. It is an excellent family companion and gets on well with children and other canine animals. The breed is naturally obedient once its role in the pack has been established.